^ Yeoman 2011, pp. 137–138. ^ Yeoman 2011, pp. 124, 138–142. ^ 14.0 14.1 Lange 2006, p. 99. ^ 15.0 15.1 Breen 1988, p. 246. ^ 16.0 16.1 16.2 Taxay 1983, p. 244. ^ Montgomery，Borckardt & Knight 2005, p. 25. ^ 19.0 19.1 Peters & Mohon 1995, p. 3. ^ 20.0 20.1 20.2 20.3 20.4 Lange 2006, p. 100. ^ 21.0 21.1 Taxay 1983, pp. 244–245. ^ 23.0 23.1 Taxay 1983, p. 245. ^ 25.0 25.1 Peters & Mohon 1995, p. 5. ^ Yeoman 2011, p. 142. ^ 32.0 32.1 Bowers 2006, p. 136. ^ Yeoman 2011, pp. 109–110. ^ 34.0 34.1 Peters & Mohon 1995, p. 6. ^ 35.0 35.1 Bowers 2006, p. 139. ^ Montgomery，Borckardt & Knight 2005, pp. 27–29. ^ Montgomery，Borckardt & Knight 2005, p. 29. ^ Richardson 1891, pp. 806–807，26 Stat L. 484, amendment to R.S. §3510. ^ Montgomery，Borckardt & Knight 2005, p. 98. ^ Montgomery，Borckardt & Knight 2005, pp. 37–39. ^ 58.0 58.1 Burdette 2007, pp. 93–97. ^ 70.0 70.1 Lange 2006, p. 149. ^ 77.0 77.1 Bowers 2007, pp. 127–128. ^ Yeoman 2011, pp. 131–136. ^ Yeoman 2011, pp. 174, 206, 227. ^ USA Today April 23, 2002. ^ U.S. Code, Title 31, Section 5112. ^ 101.0 101.1 US Mint, "2005 Westward Journey". ^ 102.0 102.1 Frazier 2005. ^ Yeoman 2011, pp. 135–136. ^ 109.0 109.1 Deisher April 16, 2012. ^ Gilkes December 31, 2012. ^ Gilkes January 4, 2012. Bowers, Q. David. A Guide Book of Shield and Liberty Head Nickels. Atlanta, Ga.: Whitman Publishing. 2006. ISBN 978-0-7948-1921-7. Bowers, Q. David. A Guide Book of Buffalo and Jefferson Nickels. Atlanta, Ga.: Whitman Publishing. 2007. ISBN 978-0-7948-2008-4. Burdette, Roger W. Renaissance of American Coinage, 1909–1915. Great Falls, Va.: Seneca Mill Press. 2007. ISBN 978-0-9768986-2-7. Coin World Almanac 3rd. Sidney, Ohio: Amos Press. 1977. ASIN B004AB7C9M. Montgomery, Paul; Borckardt, Mark; Knight, Ray. Million Dollar Nickel. Irvine, Ca. : Zyrus Press. 2005. ISBN 978-0-9742371-8-3. Peters, Gloria; Mohon, Cynthia. The Complete Guide to Shield & Liberty Head Nickels. Virginia Beach, Va.: DLRC Press. 1995. ISBN 978-1-880731-52-9. Richardson, William Allen (编). 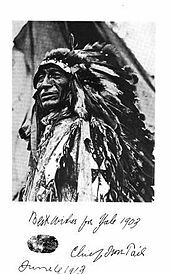 Supplement to the revised statutes of the United States 1. Washington, D.C.: US Government Printing Office. 1891. Yeoman, R.S. A Guide Book of United States Coins (The Official Red Book) 65th. Atlanta, Ga.: Whitman Publishing. 2011. ISBN 978-0-7948-3349-7. Anderson, Gordon T. U.S. to get two new nickels. CNN Money. 2003-11-06 [2016-07-02]. （原始内容存档于2016-03-04）. Bardes, Herbert C. Nickel designer gains his place. The New York Times. 1966-07-24: 85 [2016-07-02]. Deisher, Beth. U.S. must summon the courage to retire 1-cent denomination. Coin World. 2012-04-16: 15. Frazier, Joseph. 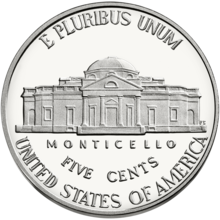 New nickel recalls historic moment. The Register-Guard (Eugene, Ore.). AP. 2005-08-05: C7 [2016-07-02]. Gilkes, Paul. Cent, 5¢ demand on rebound during FY2011. Coin World. 2012-01-04: 4. Gilkes, Paul. Mint wants more time to study compositions. Coin World. 2012-12-31: 1. Orosz, Joel J. The five founding fathers of the United States Mint. The Numismatist (American Numismatic Association). 2012-06. Porterfield, Walden R. The Billion Dollar Profile. The Milwaukee Journal. 1970-03-03: 16 [2016-07-02]. 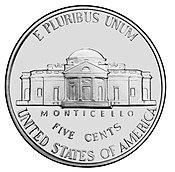 US unveils forward-looking nickel. BBC. 2005-10-06 [2016-07-02]. （原始内容存档于2016-03-06）. 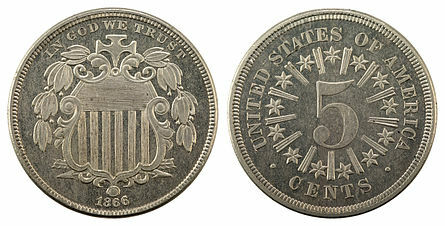 Rare U.S. coin fetches over US$3.7 million at auction. The China Post. 2010-01-01 [2016-07-02]. （原始内容存档于2016-03-05）. Jefferson nickels. Collectors Weekly. [2016-07-02]. （原始内容存档于2016-05-29）. U.S. Code, Title 31, Section 5112. Cornell University Law School. [2016-07-02]. （原始内容存档于2016-03-06）. United States Mint. 50 States Quarters Report (PDF). 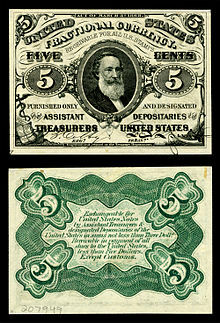 United States Mint Financial Department. c. 2009 [2016-07-02]. （原始内容 (PDF)存档于2016-03-10）. Nation to get newly designed nickels (新闻稿). United States Mint. 2003-04-24 [2016-07-02]. （原始内容存档于2016-03-04）. The 2004 Westward Journey nickel series designs. United States Mint. [2016-07-02]. （原始内容存档于2016-04-11）. The 2005 Westward Journey nickel series designs. United States Mint. [2016-07-02]. （原始内容存档于2016-05-12）. The 2006 Westward Journey nickel series designs. United States Mint. [2016-07-02]. （原始内容存档于2015-04-16）. United States Mint Moves to Limit Exportation & Melting of Coins (新闻稿). United States Mint. 2006-12-14 [2016-07-02]. （原始内容存档于2016-05-27）. 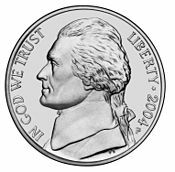 Va. legislators want to keep their nickel back. USA Today. AP. 2002-07-23 [2016-07-02]. （原始内容存档于2016-03-19）. US Mint Cost To Make Penny and Nickel Declines in FY 2013. 2014-01-20 [2016-07-02]. （原始内容存档于2016-04-22）. Cost to Make Penny and Nickel. Coinupdate.com. 2012-12-10 [2016-07-04]. （原始内容存档于2016-05-13）. Grant, Tavia. Royal Canadian Mint sees gold in the penny’s demise. The Globe and Mail. 2013-02-03 [2016-07-04]. （原始内容存档于2016-04-26）. Current Melt Value Of Coins – How Much Is Your Coin Worth?. Coinflation.com. [2016-07-04]. （原始内容存档于2016-06-17）. Gilkes, Paul. Mint testing copper-plated zinc for 5¢ coin. Coin World. 2014-02-10 [2016-07-04]. （原始内容存档于2016-07-04）. U.S. Mint Releases 2014 Biennial Report to Congress. United States Mint. 2014-12-14 [2016-07-04]. （原始内容存档于2016-03-04）.